A Kremlin spokesman says Russian President Vladimir Putin feels comfortable "in all formats that are comfortable for his interlocutors"
In this November 11, 2017, file photo, U.S. President Donald Trump and Russia's President Vladimir Putin talk during the family photo session at the APEC Summit in Danang, Vietnam. A Kremlin spokesman says that Russian President Vladimir Putin and U.S. President Donald Trump may meet in private during their upcoming summit in Helsinki. 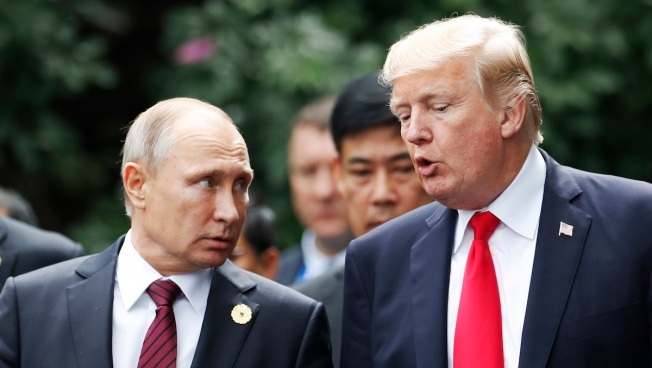 Dmitry Peskov told reporters Tuesday that if both sides agree, Putin and Trump could meet tete-a-tete without their aides before the start of the official meeting on July 16. Peskov says, "President Putin feels absolutely comfortable in all formats that are comfortable for his interlocutors" and the Kremlin "doesn't rule out" such a meeting. A U.S. congressional delegation was in Moscow on Tuesday meeting with Russian Foreign Minister Sergey Lavrov and Russian parliamentarians. Relations between Russia and the U.S. have sunk to their lowest point in decades amid U.S. sanctions over Russian meddling in the U.S. election and Russia's action in Ukraine.